Cale Green Park is a formal Victorian style park enjoying close proximity to public transport making the park available to a wide community. The Park is a valuable asset to the local community being well used by many local people and schools for recreation and learning. 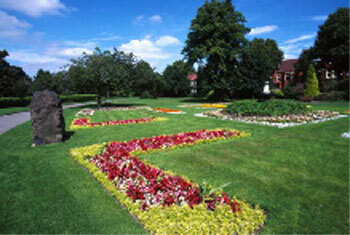 The park features a children’s play area which is well used by Mothers and Toddlers all year round. Local communities also utilise this greenspace for a range of sports and activities e.g. basketball, tennis and Crown Green Bowls. Access to all parts of the Park is excellent with paths suitable for wheelchairs throughout the Park. In 1998 the Council won a Sports Lottery award to build a multi-use sport area for use by the local community and schools. The Park has both men and women's bowls teams who are also actively involved in many of the Park's activities. A Children's Play area is well used by Mothers and toddlers all year round. The Park has been awarded the prestigious Green Flag award. Cale Green Park was a gift to the people of Stockport from Henry Bell, a local dignitary often referred to as Stockport’s ‘Grand Old Man’. The park was opened in 1902 and retains much of its original character with its traditional gates and formal layout. The Friends group (which is part of the Cale Green Park Resident Association) have regular task/tidy days on the 2nd Saturday of the month 10am - 2pm. They have restored half of the bench circle and are working on restoring the other half. They also had Tim Burgess carve an owl in Bell's Paddock. The group holds three events every year: an Easter Monday Farmers Market, a summer event, and a December event.